Departure from Service/Disposal: Returned to USN for disposal postwar. Built by Seattle-Tacoma. Laid down 20 Oct 1942, launched 22 March 1943, transferred to RN and commissioned in RN service as HMS Nabob (D77) 7 September 1943. USN designation changed from AVG to ACV 20 August 1942; changed from ACV to CVE 15 July 1943, both prior to completion. 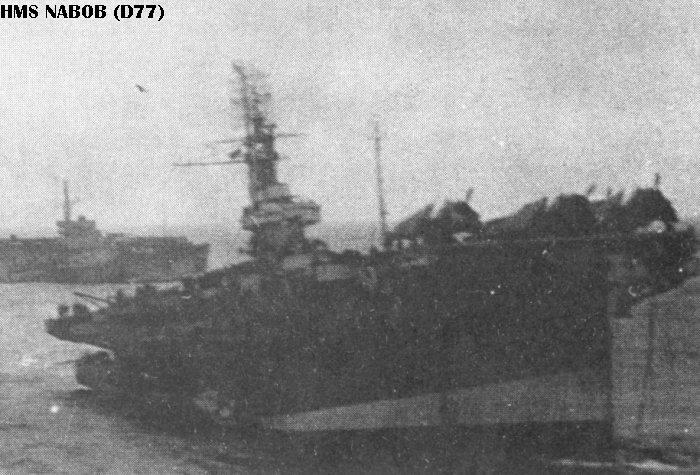 Outfitted as an ASW carrier. Manned by the Canadian Navy. Torpedoed by U-354 22 Aug 1944 in the Barents Sea with severe damage; arrived at Scapa Flow 27 August 1944 for emergency repairs. Judged not worth repairing, towed to Rosyth, beached and abandoned; decommissioned 30 September 1944 but retained in nominal reserve. Was stripped to support sisterships. Returned to USN at Rosyth and stricken for disposal 16 March 1946. Sold for scrapping in Holland 3/1947. Resold and converted to merchant Nabob in 1952. Renamed Glory 1968. Scrapped in Taiwan starting 12/1977. Built by Seattle-Tacoma. Laid down 21 May 1943, launched 8 Nov 1943, Transferred to RN and commissioned in RN service as HMS Puncher (D79) 5 February 1944. USN designation changed from AVG to ACV 20 August 1942; changed from ACV to CVE 15 July 1943, both prior to commissioning. Initially outfitted as a transport carrier by Burrards at Vancouver, Canada, but refitted as a strike/CAP carrier in the UK. Canadian manned. Served mostly as an Atlantic ASW carrier and as a training carrier. Main reduction gears destroyed 27 Nov 1944; replaced by gearing from Nabob. Used as a troopship immediately postwar. Returned to USN 16 Jan 1946, stricken for disposal 12 March 1946. Sold into merchant service as Muncaster Castle. Renamed Bardic 1954, Ben Nevis 1959. Scrapped in Taiwan starting 6/1973. Concept/Program: An ex-RN light fleet carrier loaned to Canada immediately postwar, pending completion of Magnificent. She was not winterized and thus was unsuitable for north Atlantic service. Modifications: No modifications in Canadian service. Other Notes: Returned to RN upon completion of Magnificent. Photos: [HMCS Warrior as commissioned], [HMS Warrior during rubberized flight deck trials], [Refitted with angled deck], [Argentine Independence]. Built by Harland & Wolff. Laid down 12 Dec 1942, launched 20 May 1944, commissioned 24 January 1946. Loaned to the Canadian Navy upon completion as HMCS Warrior (31). Decommissioned and returned to RN 23 March 1948; commissioned 11/1948, primarily as a trials carrier. Fitted for rubberized flight deck trials 1948-1949. Decommissioned to reserve 9/1949 but returned to service 6/1950 as a troop transport to Korea. Refit at Devonport Dockyard 3/1952 to 8 Sept 1953. 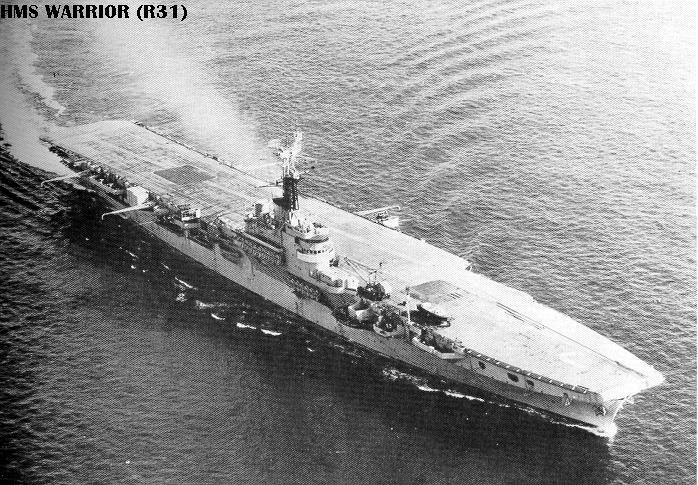 Major refit 14 Dec 1954 to 21 Aug 1956 included fitting of a minimal angled deck for trials purposes. Decommissioned 2/1958, offered for sale 3/1958, sold to Argentina 4 July 1958. Renamed Independencia 24 July 1958, transferred 4 November 1958, commissioned 8 July 1959. Assigned designation V1 was not carried. Decommissioned to reserve 1970, having been replaced by ex-HMS Venerable. Sold 17 March 1971 and subsequently scrapped. Concept/Program: An ex-RN light fleet carrier suspended incomplete at the end of WWII and completed upon sale to Canada. Replaced HMCS Warrior; she operated as a light fleet carrier. Design: Completed to the original Majestic class design. 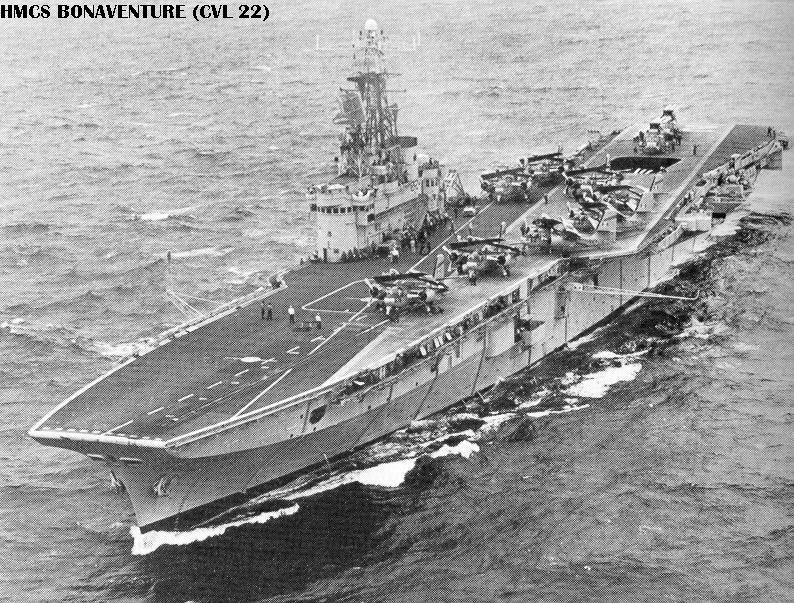 Departure from Service/Disposal: Replaced by Bonaventure in 1957 and returned to RN for disposal. Photos: [Magnificent as completed], [Magnificent late in her career]. Built by Harland & Wolff. Laid down 29 July 1943, launched 16 Nov 1944, suspended after WWII and laid up for possible future use. Work resumed upon loan to Canada in 1948. Commissioned in Canadian service as HMCS Magnificent (CVL 21) 17 April 1948 prior to completion; completed 21 May 1948. Major refit 12/1951 to 4/1952. Reclassified as a ferry carrier (RML 21) in 1954 but continued regular operations. 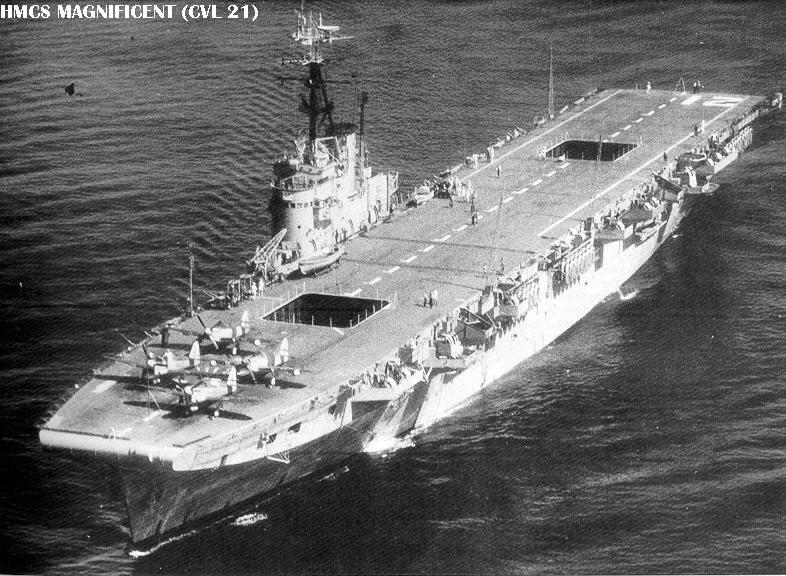 Last regular flight operations completed 10 Oct 1956, then outfitted as an emergency troopship for deployment to Suez. Decommissioned and returned to RN 14 June 1957; replaced by HMCS Bonaventure. Given designation R36 upon return and immediately placed in reserve. Concept/Program: An ex-RN light fleet carrier, suspended incomplete at the end of WWII, sold to Canada and completed to a modernized design. Originally a sister of Magnificent. Replaced Magnificent; was the major unit of the RCN for over 10 years. Design: Completed to an extensively modernized design, with an angled deck, modified island, and many other improvements over the original design. May have carried some 40 mm AA very briefly after completion. Modifications: Major mid-life refit mid-1960's. Operational: Operated as an ASW carrier after 1961. Departure from Service/Disposal: Retired without replacement in 1970 and scrapped. Photos: [HMS Powerful as laid up postwar], [HMCS Bonaventure as completed], [Late in her Canadian service]. Built by Harland & Wolff. Laid down 21 Nov 1943, launched 27 Feb 1945, suspended after WWII and laid up for possible future use. Designation changed to R95 under NATO designation system. Work resumed upon sale to Canada in 1952; completed to the modernized design. Commissioned in Canadian service as HMCS Bonaventure (RML 22) 17 January 1957. Designation changed to RRSM 22 in 1957, later to CVL 22. 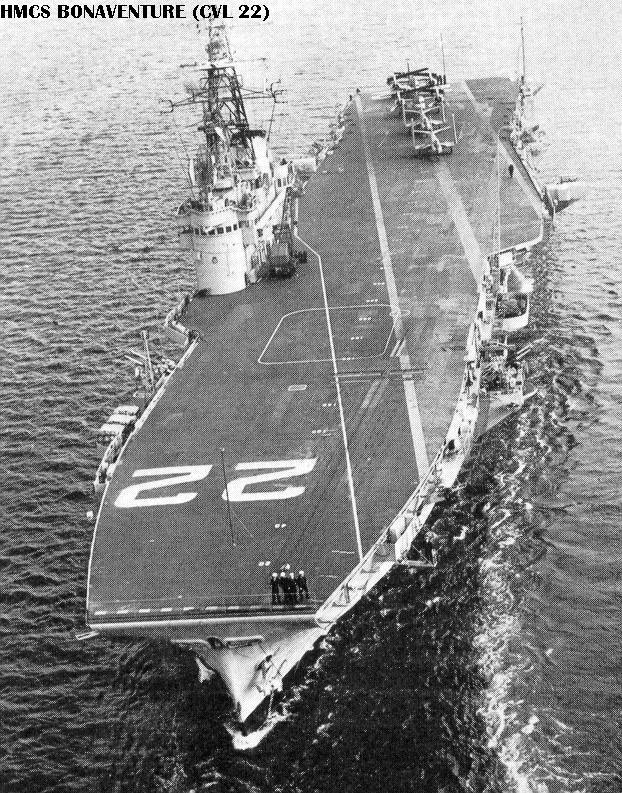 Operated as an ASW carrier after 9/1962. Major mid-life refit 3/1966 to 1 September 1967. Flight operations ended 12/1969; decommissioned 1 July 1970. Sold and scrapped in Taiwan starting 3/1971.